Bring on the Pink Petal Love! Vancouver Cherry Blossom Festival boasts about 40,000 cherry trees and counting... its definitely worth a visit to the Lower Mainland in early spring. We take cherry trees seriously here! They begin decorating the city pink by the end of March and keep right on giving well into April, perhaps May. Cherry blossom festival in Vancouver. VanDusen Botanical Gardens adds its voice to the collection of flowering trees. Photo editing - HDR. There are no strangers under the cherry trees. The cherry blossoms and magnolias always flower before the leaves come out. Mother Nature planned that so well! The leaves last many months... the blossoms last only a week or two. The leaves seem happy to stand back and let the blossoms have their 15 minutes of fame. 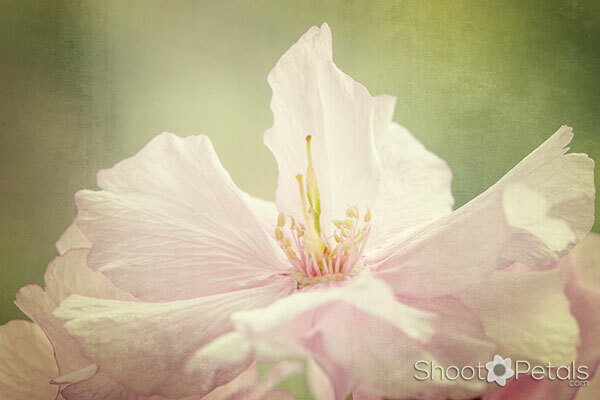 Macro photo of one delicate, light pink cherry blossom during the Vancouver Festival. Texture layers make this image even more striking. Macro places you into another world! Without the magnification of a macro, so many intriguing details escape us. A macro lens narrows our awareness to nature's most exquisite miniature creations. Besides a dedicated macro lens, you'll absolutely need a tripod. You'll also need to know how to get perfect exposure and tack sharp focus. You can't leave anything to Auto! Take a few steps back for more petal-power. ... I promise we'll still be close! 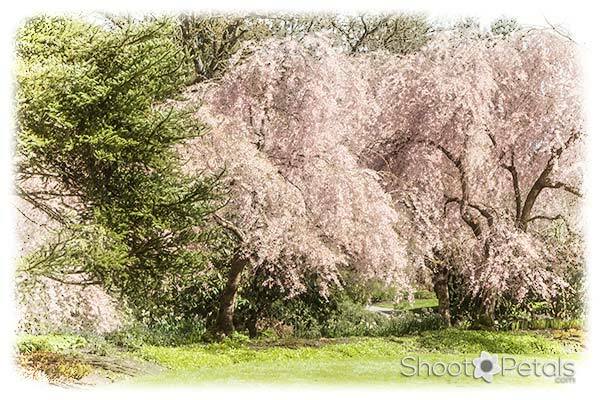 To tell a complete story you need close up shots as well as landscapes of these magnificent cherry trees and blossoms. 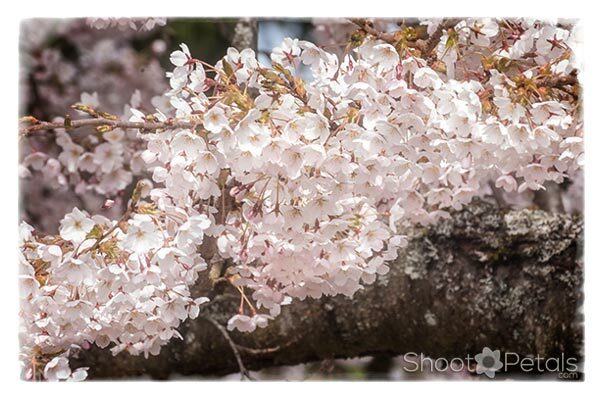 Each of these 4 images taken during the Vancouver Cherry Blossom Festival have different photo editing treatments. In fact, this first shot of delicate white flowers has only very minor adjustments from the original RAW file (Nikon D7000 camera and a Nikon 24 -70 mm telephoto lens). 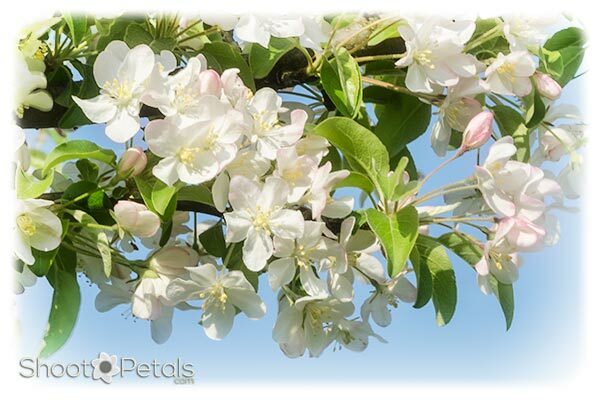 Delicate white cherry blossoms. Close up shot of a branch of flowers against a clear blue sky. Minimal photo editing. 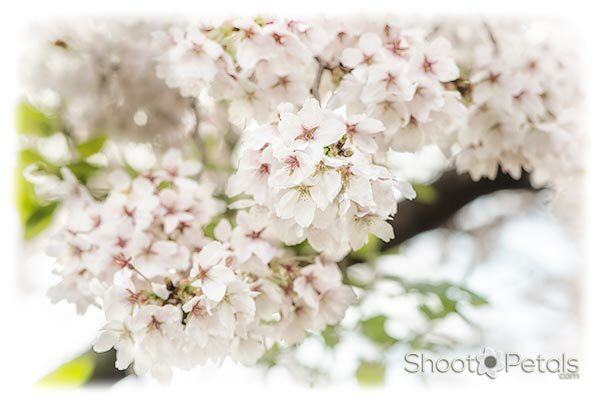 Pure and simple image of dainty white cherry blossoms. Other than minor tweaks of the RAW file, there's only a white vignette to finish it off. It was a clear sunny morning and the sky is an amazing luminous blue. These pretty-in-pink double cherry flowers got a bit more beauty treatment... a texture layer of light leaks perks up the photo with gold and orange. It was a little "fussy" in the top corner and the light leak totally obliterates and simplifies the background. Adding a blur could have done that, too, but the colour peps up the image so that's what I went with. Light leaks rev up a branch of double pink cherry blossoms in Vancouver. Not much more than a light leaks texture layer, except for adding a white framing effect. I like the way the branches and blossoms angle across the frame. The blurred walk in the background also angles across in the opposite direction. This branch of white single blossoms has an HDR look to it. (HDR = High Density Range). That means that the image shows greater detail from light and bright to dark areas in the photo. There are apps in cell phone that capture images in HDR. It doesn't always look real. There's a more subtle look and then there's the surreal, over-the-top look. You can create an HDR look in your photo editor by using presets from other photographers or by cranking up your clarity and sharpening and a few other adjustments. I used a preset in Perfect Photo Suite for this image and then made my own adjustments to each layer to taste. 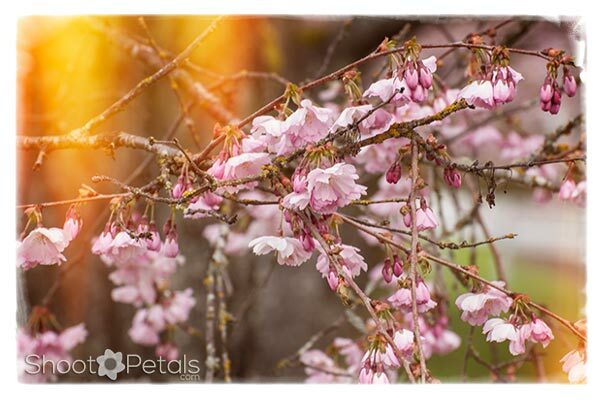 An HDR look to this photo of a branch of light pink cherry blossoms. It's spring in Vancouver. The HDR, over-sharpened look is quite a contrast to the next image. I've become a "softie" in the last year. Softening instead of sharpening, glows, white vignette edges, blurs and reduced saturation. .. I love the look. A branch of a Yoshino cherry tree in bloom. It's spring and the Vancouver Cherry Blossom Festival is in full swing. These cherry blossoms are white on white with just enough green and pink so that the image isn't totally flat. If you're taking a photo like this, angle the branch across the photo rather than straight across. In my view, this is a more engaging photo than the image above, both for the softness and the angle of the branch. This tree is absolutely fabulous! The twisty, curly trunk reminds me of a Harry Potter"ish" sort of tree! 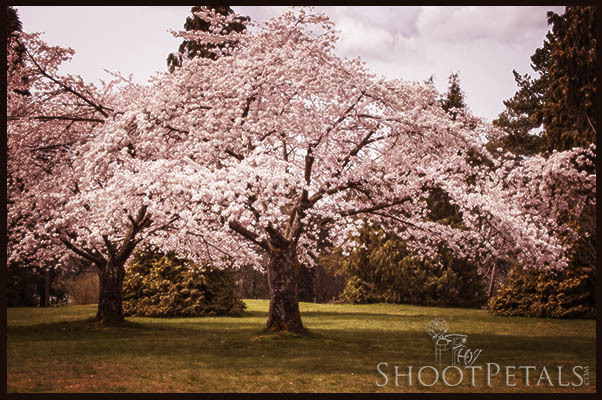 This magnificent, and much photographed, tree is in Queen Elizabeth Park and is one of the stars of the Vancouver Cherry Blossom Festival each year. Photographers and cherry blossom groupies just want to gather under it to share its space and positive energy. This is a tree with character! No matter what angle I photographed it from, the shape was powerful. Spring in Vancouver, the cherry trees are in full bloom. Here's a beauty at Queen Elizabeth Park. Photo editing antique look with light leaks. I edited it several different ways (I just love playing)... this faded, antique look was my favourite. The colour around the edges is called a light leak. That might happen on an old film camera when a lens doesn't fit well and light seeps onto the negative. The soft, desaturated look adds to the feeling of an "old" photo. The "light leak" is added as a layer... along with layers of desaturation, edge vignetting and a frame. The Vancouver Cherry Blossom Festival sports a number of different species of cherry trees with shades of pink to delicate white... single and double flowers. No shortage of picture prospects. This "glowing, pink umbrella" is in VanDusen Botanical Garden. VanDusen Botanical Garden is a major contributor to the spring Cherry Blossom Festival in the Vancouver area. Here's just one glowing example. To get this glowing look, decrease your clarity and contrast and add a radial blur effect... put each effect on a new layer so they can all be adjusted to taste without changing every effect. For your photo composition... always fill the frame with your main subject. There isn't very much except the cherry tree and the pink blossoms in this photo so this photo's story about the Vancouver Cherry Blossom Festival is obvious. At that time the sky had light cloud cover so the light was even and soft ... perfect for photography. Bright white skies aren't very exciting so hide them the best you can. The cherry blossoms and the green trees behind mask the bland sky and only tiny bits of it show through. If I'd taken the photo from a different angle, there would have been a large, boring white sky... yuck! Imagine people sitting under these cherry trees having a picnic. That's "Hanami"... celebrating the blossoms with friends and relatives... sharing food, drink and great company under a pink canopy. Interested in some saki? Two graceful, flowing cherry blossom trees in QE Park. Photo edited in ON1. 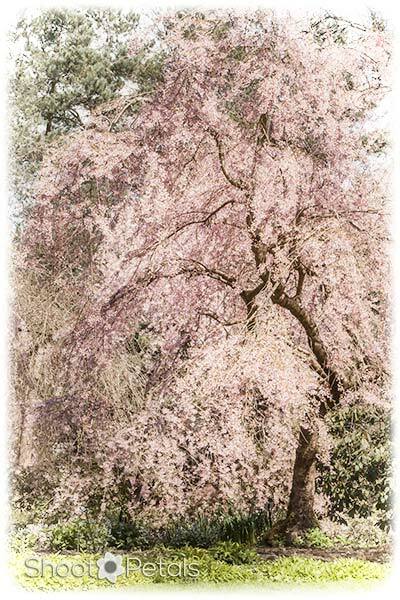 Another brilliant tree blooming during the Vancouver Cherry Blossom Festival at VanDusen Botanical Garden. This image looks old and discoloured. Besides applying a Kodak frame, the effect was built up with HDR, dark vignetting and light leaks.... plus a layer to bring out the texture in the clouds. Voila, my photo became a coloured pencil sketch. It's amazing what you can do in photo editing software. 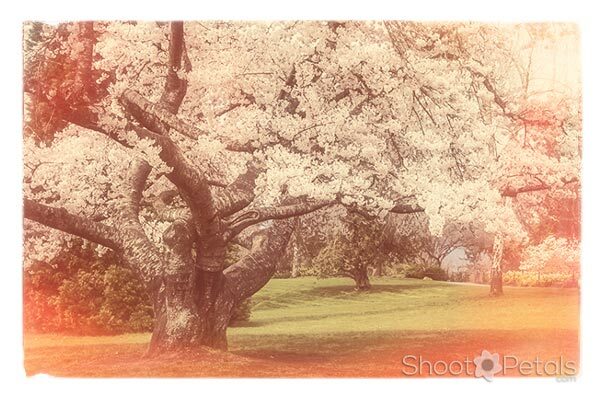 This cherry tree image doesn't look so much like a photo any more. It looks more like an artist's coloured sketch. 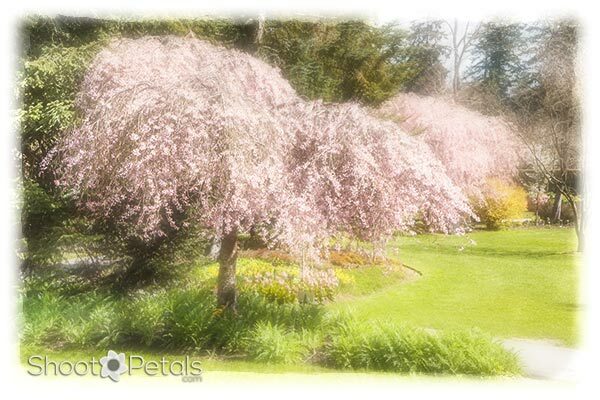 A beautiful example of a flowering cherry tree in VanDusen Botanical Gardens, Vancouver. Photo editing makes the image look like a coloured sketch. I edited it using primarily an HDR treatment. That's over simplifying but it's what gives the image that crisp look. The newest Photoshop CC doesn't have the painting filter and it's a heck of a lot of fun to try. You can search for other programs that offer an oil paint filter if you'd like to make some of your photos into paintings. They believe only itty-bitty, basic tweaks are okay. Then there are the artistically inclined. They want to push the limits in editing. There's a place in life for both! If you shoot RAW, you have to put your image through an editor or convert it to JPG, PSD or TIFF to do anything useful with it. RAW needs some tweaks to "develop" it. Some super-duper shots don't need much. If you're a journalist, you can't edit anything out or add anything... the original photo is how it is! Journalism depends on telling it like it really is so you can't artistic license. I love pushing it in Photoshop, but sometimes an image just looks best 'au naturel'. Only minor edits, with a vignette or frame look best. Like this wall of cherry blossoms. I tried getting funky but it didn't work. 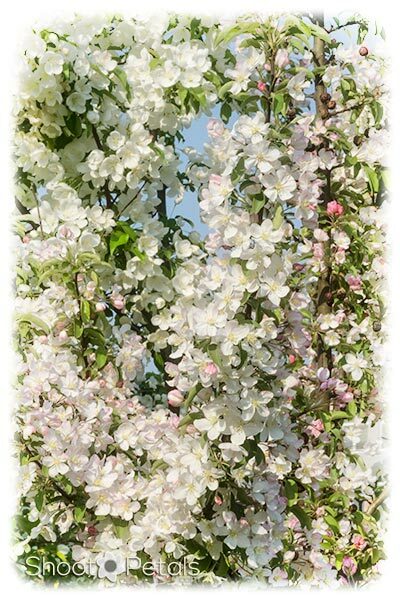 Image of a "wall" of cherry blossoms. The photo has only minimal editing. It's spring in Vancouver and Hanami is in full swing. It really does look like a wall of blossoms, but it's just that the branches of the tree are so thick and heavy with blossoms. Vancouver Cherry Blossom Festival only lasts for a short time... maybe that just adds to our unceasing anticipation of the blossoms' arrival each spring. Did you know that your cell phone is a very capable camera? Who needs an expensive DSLR? Not you! Just some simple tips for your iPhoneography and abracadabra, your cell phone will be turning out fabulous pictures for you! Vancouver Cherry Blossom Festival has a short window of opportunity for photographing thousands of cherry trees. To keep up to the news for the first signs that the blossoms are blooming, keep tuning in to the Vancouver Cherry Blossom Festival website. Since you're a photography buff, why don't you send in some of your photos to the photo contest they hold each year? And if you're a social butterfly, check out their community events. The April calendar is solid with festivities. Wonderful texture in the cherry tree bark. A Vancouver spring cherry blossom celebration. Lovely moss adds to the beauty of these tree trunks. 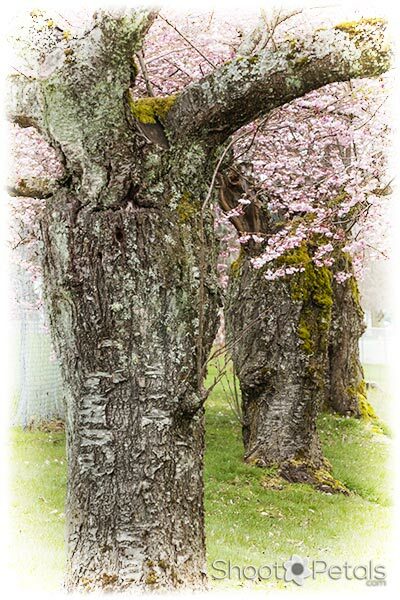 There's a lot to learn about cherry trees and their history in the Vancouver Cherry Blossom Festival. There's a section in the website devoted to education. It's always a good idea to get familiar with what you're photographing. The cherry blossoms are richly symbolic... they represent the fragility and miracle of life. Like the blossoms, life is short and precious. In Asia, cherry blossom viewing is a major event each spring with millions of people coming together in celebration. That tradition has spread from Asia to North America and Europe... kind of like the sakura zenzen, the wave of blooming cherry trees as they move northward in Japan.